The SWLP.2450.10.4.A.02 patent pending 10mm SMT ceramic patch antenna is a breakthrough antenna in terms of size and performance. 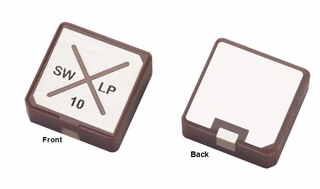 The smallest 2.4GHz patch available worldwide, it is ideally suited for 2.4 GHz applications such as Bluetooth LE, Wi-Fi, ISM, and ZigBee. It was developed specifically for Bluetooth LE wearable applications to work directly on ground (except for feed area) and over metal, device environments which traditional chip antennas cannot operate in. The antenna also does not need ground plane clearance around it (except for feed area). It provides omni-directional coverage similar to chip antennas on small boards. The antenna exhibits 24.8% efficiency on a 12*16mm ground plane at 2455 MHz. If utilized on a 50*50 ground plane, efficiency will improve to 40% at 2455MHz.